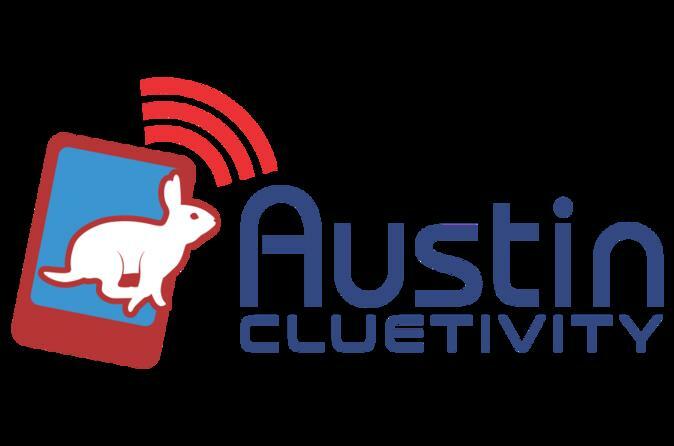 Austin Cluetivity combines the best elements of classical treasure hunts, GPS-Geocaching and Live-Escape-Games with Augmented Reality Technology into a new outdoor team game. The basic gameplay is simple: Go to places in your city, crack tricky riddles and solve your mission. Whether you interact with virtual avatars in real places or unravel tricky puzzles with your Action Pack, Austin Cluetivity is an action-packed adventure for families, friends and colleagues. Austin Cluetivity games begin with a game orientation at one of several starting locations around the city. Groups are organized in teams of up to six players per iPad/Speaker/Action Pack. After a 2-3 minute themed intro to the game a map will appear on the game iPad, zooming in and out helps player navigate to GPS points that are a part of the game. Once your group arrives within a certain range of the iPad crystal, a "play" box will appear on the screen. Player tap on the iPad to open the game element that will involve solving a puzzle, riddle or augmented reality element, after someone taps on the crystal that element is solved and additional crystals drop on the screen as places to explore. There is a time limit to complete all the tasks to save the world of 90 minutes. Will your team have what it takes?